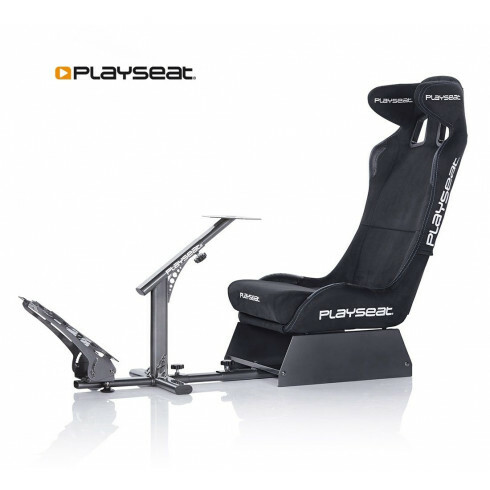 Take a seat and drive as fast as possible in the Playseat® Evolution Alcantara PRO! When you're racing with this Playseat® chair, it feels like your in a real racing car, thanks to the authentic shape and the high quality black Alcantara coating, which is an alternative to suede and used in real racing cars! Was blown away from the quality and ease of build with the Alcantra pro, blown away with the service and customer care ! Can't wait for future products ! I received the Alcantara Pro with Playseat Mat. The combination of those with my Logitech g920 wheel is incredible. The quality and attention to detail is incredible. I was also pleasently surprised at how compact the chair was when it came to storage. Can't wait to add more to this chair from Playseat! We started with the foldable entry level seat and it was great for our first year and decided to move up to a more substantial seat - The Alcantara Pro. It is spectacular and the positioning of the pedals and steering wheel is much more realistic. The assembly was pretty easy and we were up and driving within one hour. We appreciated the fast delivery too as this was a Christmas present. So much fun! So comfortable! The playseat Alcantara Pro was easy to build, made from quality parts, fit my Logitech wheel and pedals perfectly. It may seem a bit pricey when you're shopping for them, but seriously, its worth every penny. Its so comfortable, I sit in it to play all my games now. I even like the quality of the stitching! Anyways, if you're mulling at all if you should buy one, totally do it, you won't regret it! Delivery was fast as well. I had one of these years ago and thought there was some places for inprovement back then. After receiving my new on, I am definitely really surprised and excited that improvements were made. The frame is thicker and more stable. They also improved the connections of the parts, since they used to slide around some. Overal I'm super happy with it! 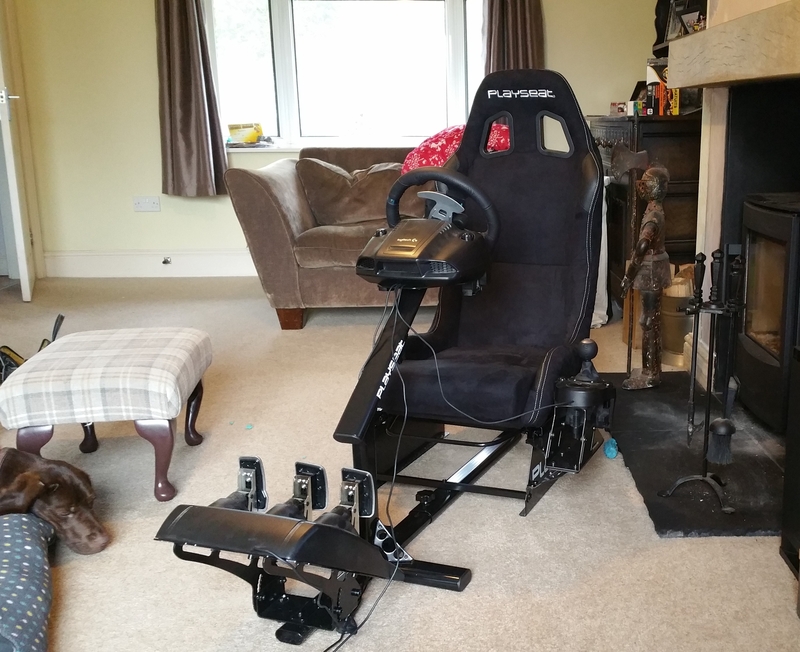 I have a Thrustmaster t300rs gt racing wheel and bought this chair to mount it on in order to race on my ps4 and pc. This chair has far surpassed my expectations. I have had an absolute blast with the beginning of my new hobby of sim driving. This chair is sturdy (I'm a big guy at 6'4" and 300lbs) and comfortable. I have no issues with my height and the adjustments that it allows for the wheel height and distance, along with the distance to the pedals. I would recommend this product in a heartbeat, and already have. This unit is top notch in quality. Everything is adjustable to fit you perfectly. Super solid construction, no wobble. Alcantara is amazing. Fast shipping and best simulator bang for the buck! Ordered the Playseat en got delivered to Iceland, witch is in the middle of nowhere and that in 4 days. And with free shipping. Love the site, love the service, love the product. Mijn zoon 15 jaar heeft deze seat gekocht. Eenvoudige montage even zoeken naar de juiste instellingen, fantastische raceervaring! Going from a wheel stand to this is an absolute delight. I have a Logitech G29 and it works beautifully with it. Having the wheels and seat and pedals all braced together means you don't get the usual distractions of a wheel stand constantly trying to shift position. When you get the box you will think "Well they forgot to pack something in here" because it is far too small to contain everything. I can only assume the guys at playseat store spend half their life in a sardine packing factory and the other half playing tetris, because from this small box emerged everything I ordered. All the stuff is good quality and fits together well. Don't rush the build part, enjoy it. look at it like it is the best meccano set you will ever use. Once built dont go strapping down all the wires to the frame straight away, have a few hours of getting used to it. I thought I had the perfect driving position but after playing for a couple of hours i tweaked it around, so best to get happy with the set up before you commit to where you run your wires. If you get a shifter stand get the ones that attach down near the seat and not up by the wheel, it is a much more natural place for it to be. I am 41, i should have grown out of stuff like this but I was grinning like an idiot on my first go. Love it. Perfect for my racing sim, the only cons is that the playseat sign where i sit is printed on a bad angle but not very noticeable. Purchased the seat for my 13 year old grandson. He assembled it with little assistance from me. He has use it many hours, and is very impressed with the quality, durability and functionality. Excellent product for a reasonable price. After having played with the Wheel Stand Pro for a few years, I wanted to upgrade my simracing feeling. After a sophisticated research, I decided to purchase the Playseat Alcantara Pro. After one week of intense racing, I am absoultely convinced that this the best seat in this price rance. Stable, nice design, comfortable, even after several hours of playing. Wouldn't change it, wouldn't buy anything else. The installation was easy to do. Thanks to the help of my father I managed to set it up fast. The individual adjustment for my body size was no problem.